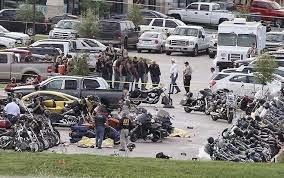 WACO, Texas (PTSD News Service) – The National Rifle Association announced today that if all the bikers in Waco, Texas had guns, it could have saved the lives of the nine Americans killed in the incident outside a bar and grill. “Those that brought knives, chains and brass knuckles to a gun fight could not properly protect themselves,” said NRA President Jim Porter. The NRA called for legislators to pass laws to make it easier to for white guys who like to ride free with the wind in their hair to exercise their Second Amendment rights by eliminating pesky background checks, discriminatory wait times and any and all other unnecessary obstacles to a man right to protect himself. In addition, the NRA will be introducing legislation that would allow bikers to purchase guns, ammunition and even motorcycles on food stamps. “If those welfare queens can buy new Cadillacs with food stamps, bar traditionally acceptable Americans from using those same food stamps for a life or death matter, that is, guns and ammo. Every biker deserves a fair shot,” said Executive Vice President Wayne LaPierre. NEW YORK – (PTSD News Service) – Ringling Brothers and Barnum and Bailey Circus announced today that they will cease using clown cars in its shows by November 2016. 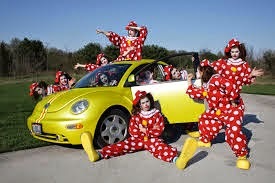 The said their decision to eliminate clown cars was due to a growing concern regarding the misuse of such vehicle by the group of declared Republican candidates for the 2016 Presidential election and those as yet undecided candidates who are expected to announce shortly that they will enter the clown car with them. “With Ted Cruz, Dr. Ben Carson, Rand Paul, Carly Fiorina, Marco Rubio and now Mike Huckabee, we cannot guarantee the safety of the clown car or anyone in its path,” said Alana Feld, Executive Vice President of Ringling. Some anti-clown car activists say the circus should stop using the clown car immediately. “Can you imagine another Bush trying to drive anything in a safe manner or what could happen to the normal flow of traffic if Chris Christie should get to drive the clown car?,” said Brianna Bjorn, President of People for the Ethical Treatment of Everything. The clown car has traditionally been part of the circus company’s shows, but after a lengthy debate among its senior executives, it was decided to end the car’s run because, “what used to produce laughter now has many Americans fearing for their very future,” Feld said. The circus will continue to use other vehicles, such as old fire engines and the trucks necessary for travel to and from their various engagements. The retired clown cars will be placed on display at the International Clown Hall of Fame and Research Center in Baraboo, Wisconsin.